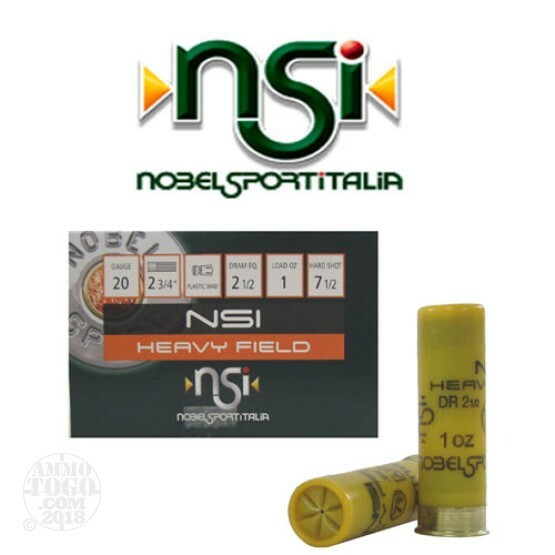 Manufactured in Italy by Nobel Sport Italia, these NSI heavy field 20 gauge loads are perfect for hunting doves, quail, grouse and other upland game birds. This Italian-made ammo combines tradition, research, innovation, and dedication to bring you some of the best sporting ammunition on the market today. Each 2 ¾ inch 20 gauge shotgun shell is loaded with 1 full ounce (2 ½ drams) of high antimony hard lead #7 ½ shot. These factory fresh rounds feature the finest plastic hulls, even patterning wads, and famous NobelSport 209 primers. Each round produces a consistent muzzle velocity of 1165 feet per second. This ammunition is packed in 25-round boxes.